Will Iraq's next Government be . . . Iran-backed Shiite Militias? Will Iraq’s next Government be . . . Iran-backed Shiite Militias? The [so-called] Islamic State [IS] group has caused a realignment of Iraq’s political map. Next year’s provincial elections will signal who will rule the land after the security crisis has passed – and it may not be to everyone’s liking. In April 2017 Iraq will hold its next important round of elections. These are the elections during which voters will choose provincial officials and council authorities – and, despite the ongoing security and economic crises, the country is already looking ahead to this event. Voter registrations have started and political parties are planning campaigns, albeit behind closed doors. But at the same time there is no doubt that the security crisis sparked by the extremist group [IS — or ISIS, ISIL] has changed long-maintained power structures in several provinces. Existing alliances have collapsed, sitting leaders were expelled and new ones appointed while new groups are vying for power with old. In the four provinces almost completely controlled by the extremist . . . IS, group at one stage or another, governors lost their jobs and there were major changes in Sunni Muslim political alliances. These changes will certainly impact how the provincial elections are conducted and their outcome. Also adding to the new situation in Iraq is the existence and power of Shiite Muslim volunteer militias, some of whose leaders appear to have political designs on Iraq’s provincial and national governments. Next year’s provincial elections are going to provide a snapshot that shows exactly who will be able to claim power after the security crisis is over. The answer may not be to everyone’s liking. In Diyala province, the standard Iraqi political quota used to function well. If the governor of the city was a Sunni Muslim, then the head of the provincial council should be a Shiite Muslim. After the 2013 provincial elections, Amer al-Majmai, was appointed governor of Diyala. However, after the . . . IS, group attacked various locations in the province, the security structure in Diyala collapsed, with the police and Iraqi army all but powerless. The Shiite Muslim volunteer militias arrived in Diyala and managed to fight the IS group off. The volunteer militias included some of the more extremist groups as well as the Badr organization, who are heavily supported by Iran. And this victory made the volunteer militias – and thereby the Shiite Muslims of Diyala – a force to be reckoned with in the province. That is even though, according to the most recent data, which is several years old, the province was just over half Sunni Muslim, with one third Shiite Muslim and the rest Kurdish. The Shiite Muslim forces called for political change and al-Majmai was voted out of office after being accused of corruption. Muthana al-Tamimi, a Diyala politician who is also a senior member of the Badr organization, is now governor – he was elected to the position only a few hours after al-Majmai was expelled. Since then al-Tamimi managed to convince Sunni Muslim politicians on the provincial council to enter into an alliance with him. In Anbar province the IS group managed to take control of over half a dozen important cities. After much fierce fighting and wholesale destruction, pro-government forces, including the Iraqi army, an international coalition providing air cover and the Shiite Muslim volunteer militias, were able to drive the IS group out of most of Anbar. As one might expect the provincial government has been very much affected. Last month members of the provincial government voted to dismiss Anbar’s governor, Suhaib al-Rawi, and to appoint a former governor, Ahmad al-Dulaimi, who had been injured during the fighting against the IS group. Today there are three strong groups hoping to play a part in Anbar’s leadership. The first is the Iraqi Islamic Party, the major Sunni Muslim political group that has held power here for over a decade. However, during the past two years, its popularity has waned in Anbar and other Sunni-majority areas. The third force is a coalition of local tribes who fought alongside pro-government forces against the IS group. In the past these tribes – including the al-Bu Nimr, al-Abed and al-Bu Fahd tribes – did not have any political representation. But now their fighters are a major part of the security framework in cities where the IS group was pushed out. Part of this has meant their political ambitions have also grown. The IS group’s power has diminished steadily in Salahaddin province and now only one city, Shirqat, remains under the extremists’ control. But the past 24 months have seen significant changes in the political life here. Today two teams of politicians are competing for power in Salahaddin. One is led by former governor, Ahmad Abdullah al-Jibouri, and the second by current governor, Raed Ibrahim al-Jibouri. Somewhat ironically the two men are cousins. Raed al-Jibouri believes he should be in charge because he has the support of locals and perhaps equally importantly, the Shiite Muslim volunteer militias, who helped to push the IS group out of the province. One of the most senior members of the volunteer militias, Abu Mahdi al-Mohandes of Hezbollah in Iraq, has described him as “the righteous son” of the militias and said that he played a big part in helping fight the IS group in Salahaddin. Raed al-Jibouri has tried hard to justify the militias’ presence in the province after the extremists left but his cousin’s political alliance rejects this idea wholeheartedly. The latter want the militias to leave and to see the former security framework reinstated. The province of Ninawa has been one of the worst impacted by the presence of the IS group, who made the provincial capital, Mosul, the capital of their imaginary kingdom. The al-Nujaifis, a family of prominent Sunni Muslim politicians, had run Mosul since 2009. As such the province had had a fraught relationship with Baghdad and the Shiite-Muslim-dominated government of Nouri al-Maliki. But in 2015, after Mosul fell to the IS group in 2014, the Iraqi Parliament voted to remove Atheel al-Nujaifi from his position as governor. Al-Nujaifi was replaced by Nawfal Hamadi al-Sultan, who is considered close to the current Iraqi government. The security crisis has also had an impact on southern Iraq, where provinces have a mostly Shiite Muslim population and have not been as badly affected by the IS group’s rampage. The IS group didn’t manage to take over any Shite Muslim or Kurdish cities because part of their appeal is that they initially presented themselves as saviours of the country’s Sunnis. Yet the southern areas have also had to face, and will continue to face, political danger. 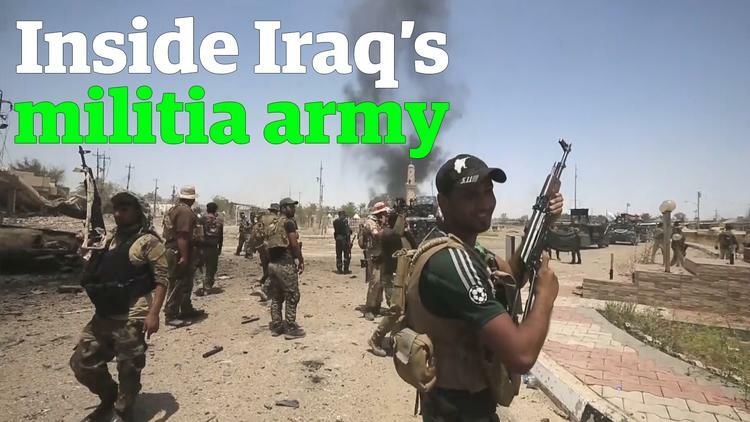 Thousands of volunteers from southern Iraq joined the militias set up to fight the IS group. These militias, made up mostly of Shiite Muslim volunteers, have become hugely popular in Shiite areas and are mostly seen as heroes – that is even though here has been some controversial behaviour, with revenge killings and persecution of people in former IS-held territory. As the elections approach, the political ambitions of some of these militia’s leaders are increasingly apparent. Many Shiite Muslims blame the existing and long-standing Shiite Muslim political parties for the lack of public services and security, as well as unemployment and economic recession. The militias are seen as the opposite of the politicians, who cannot seem to get anything done. The existing Shiite Muslim-dominated political parties can clearly see the danger presented by the wildly popular militias. Behind closed doors there are already negotiations underway between the political parties and the militias to form alliances, as it is clear that the militias will win many votes in 2017.